Utilizing these two surveys, the Meaning & Purpose resources help members identify if they are " Spectators," "Investigators," or "Participators." The questionnaire is a very basic, non-threatening survey to encourage members to grow beyond being a spectator to becoming an investigator to eventually becoming a participator in the various ministries of the church. The Uniquely You Change Indicator is another brief questionnaire that helps members identify their 4 DISC personality type as it relates to change. It is not a thorough personality profile, but rather an abbreviated version to help members deal with change from a biblical Human Behavior Science perspective. Discipleship and growing from spiritual infancy to maturity requires change. Understanding how everyone responds to change from his or her personality indicator graph is extremely practical and powerful. 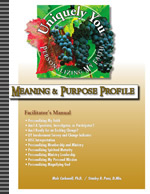 The Meaning & Purpose Profile also review step-by-step the entire process from the start, through each of the steps, to the ultimate final step of Magnifying God Members Guide. Once members start the process right, they will be more apt to continue toward the Membership &Ministry class. Each course or step can be used independently of the others or to build on from one course to the next as a comprehensive discipleship/assimilation results-oriented plan. Are You A Spectator, Investigator, or Participator? Are You Ready for an Exciting Change?